The way a major company like Toyota brings a new car to market is pretty well set – early concept from long discussions, extended periods of design and research, early prototypes, endless testing, shows, finessing, and finally launch. It’s a slow and careful process, and one which has been turned on its head for the launch of one of the most exciting and eagerly awaited cars to wear the Toyota badge. 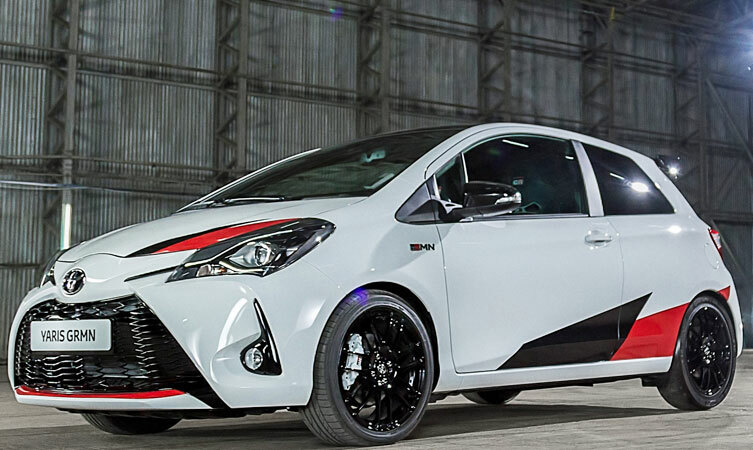 The new Yaris GRMN is a supercharged, sharp-handling, barking, shouting, blisteringly quick version of Toyota’s much-loved city car which marks the brand’s return to the hot hatch sector. Torsen-type limited slip differential, lightest in its class, around 215bhp from a supercharged 1.8 engine, race-spec lightweight forged alloy wheels, a bespoke centre exhaust system, four piston brakes… this is a special car conceived in a special way. An exclusive team of engineers, test drivers and technicians came together at the infamous Nordschleife and the challenging roads around it to deliver a car which breaks all the normal rules of development (not least financially – Yaris GRMN probably gave the company accountants nightmares). Recently one senior journalist described the process as “like Toyota’s Skunkworks”, in a reference to the small team of Lockheed Martin engineers who produced some of the world’s most iconic aircraft by being allowed to do their own thing outside the normal rules. The brief was simple: Link the Yaris competing in the World Rally Championship more closely to the road car by making a hot hatch with class-leading performance from which skilled drivers can extract the very best. A look at the spec tells you it’s special, as we’ll explore in a moment. And it’s also the first GRMN Toyota to be sold in Europe. So what is GRMN – or “Gazoo Racing Tuned By Masters of Nürburgring”, to give it its full name? It is a concept well established in Japan, where it’s well understood that a GRMN car will always be the most focussed, high-performance version of any Toyota model, and also the most exclusive and rare. And this red hot Yaris GRMN is no exception, with only 400 vehicles being made available in Europe. When they’re gone, they’re gone (and like the car itself they’re likely to go very quickly). Anything which carries the GRMN badge is certain to be a serious performance car, and amongst the rarest on the road. 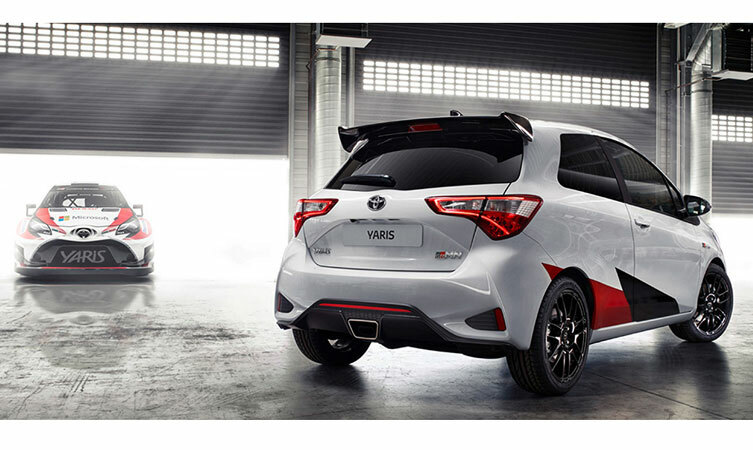 The GRMN Yaris was designed and built by an international team of specialists, based both in Toyota’s European HQ and also at its permanent facility at the Nürburgring. The best individuals and teams were brought into the project from all over Toyota, along with very select partner companies (for example Lotus from the UK provide the supercharging and other engine enhancements, while the Japanese firm which built racing seats for Lexus’s legendary LFA supercar spent weeks at the ‘Ring perfecting the design for the Yaris’s sports seats). A glance through the car’s spec gives an idea of just how unusual this project has been. The car is awaiting final homologation but it will have between 212 and 215bhp, hit 60mph from a standing start between 6.3 and 6.5 seconds, and through race-bred engineering and carrying less weight than any competitor, it is designed to out-handle as well as out-run all of them. The base 1.8-litre engine (built at Toyota’s plant at Deeside in Wales) has been shifted to fit in the Yaris and uprated. It is supercharged and then fitted with bespoke intakes and cooling systems, including an oil cooler. Such power presented too much of an issue for any exhaust which would fit the car, so a bespoke system with a centre exit to mirror the WRC Yaris was designed to be able to deal with the back pressure involved while still meeting emissions regulations. 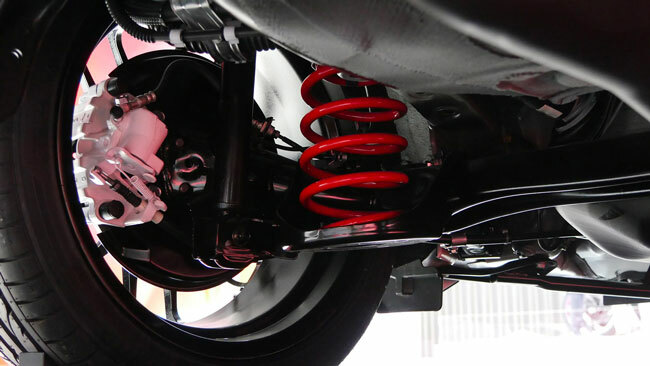 The entire floor of the car is altered to help provide extra rigidity, with specially made Sachs Performance suspension components at each corner, sitting the car considerably lower than its “normal” sister car. Meanwhile a tower bar can be found at the top of the car’s McPherson strut to give even more stiffness under hard driving. 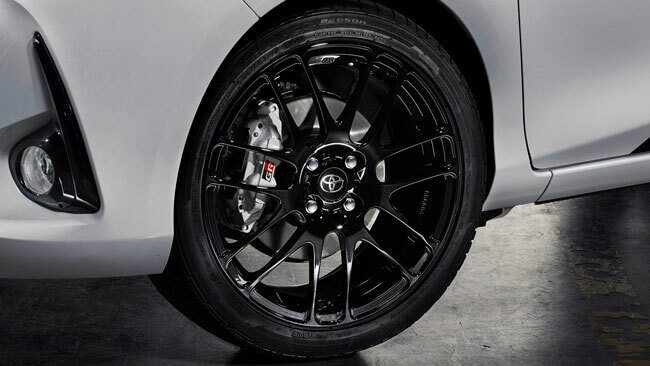 Braking comes from enlarged discs and, even more impressive for a car in this segment, four-piston callipers designed not only to give immense stopping power but just as crucially, and in the spirit of the brief, to give more braking feel to skilled drivers who know how to exploit it. At each corner sits a black 17″ BBS alloy wheel, forged to save even more weight (in this case about 1.5kg per corner). No other car in the segment can boast forged alloys. In the centre of the GRMN is a torsen-type limited slip differential, which designers felt was essential to handle the power involved and allow drivers to use it best, while the gearbox has been strengthened to cope with the forces in play. Function-first aero is obvious from the outside with the larger rear wing and deeper spoiler, as well as more subtle tweaks and additions all aimed at giving stability. Inside things are very different to normal as well. Seats designed by Japanese specialists Boshoku provide perfect support under hard driving, but comfort in more normal situations. The small steering wheel suggests driver-focus and the materials and colours in the cabin make the car’s purpose crystal clear. Even the building of the car will be special, with the 22 most skilled technicians at Toyota’s French manufacturing base chosen to be the build team. Nobody else will be allowed to work on the car. In the UK all Yaris GRMN cars will come with both DAB and navigation as standard too – recognising that however performance focussed a car is it must also be practical and usable every day. As befits such a special car, the Yaris GRMN is not being sold in the usual way. You can find out more about it, see more images and video and find out how to be one of the exclusive 90-100 people in the UK who will end up owning one these very special cars on Toyota.co.uk. Hi when will we be getting a GRMN GT86. Thanks for getting in touch. We have no news on this at the moment, but keep an eye on our blog and social media channels for the latest updates. Thank you for your kind words, Mario. "Hello John, Thanks for getting in touch. We would advise for you..."
on Tyre Pressure Monitoring System (TPMS): What is it and how does it work? "Hello Maciej, Thanks for getting in touch. The recommended engine..."
on Engine oil: What oil for my Toyota? "Hello Syed, Thanks for getting in touch. If you could please prov..."
"Hi, I have Toyota Avensis 2008 2.2 177km, (GY08okp). What is the..."